Two years ago, I wrote and shared an article entitled “Universal Manhood: Integrating Manly Proficiency and Catholic Self-Sufficiency.” If I’m honest, I was not-so-subtly hinting at something I couldn’t bring myself to say out loud quite yet: I have a latent prepper streak. There is a part of me that is increasingly convinced that, if not my bride and I, certainly my children and grandchildren will experience basic deprivations of many of the comforts and freedoms we enjoy today, and will have to make do or improvise to survive. 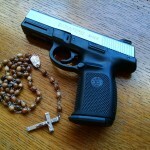 Catholic blogs like Catholic Prepper and Tactical Catholic. At a glance, I like these Catholic approaches more that some other survivalist material I’ve seen online. I especially like the emphasis on practical skills and planning; the balance between preparation and trust in God’s providence; and the call to preserve not just one’s self, but family, church, and community. I would like to see our little Catholic community here grow into something like this: a community of believers still living the mission to make disciples of all nations, but prepared to take care of our own, to defend our beliefs and our rights as persons made in the image of God, to fight whenever and however appropriate, and to willingly embrace suffering for the Kingdom. We should be sharing with our children how to grow and gather food, how to do basic home and auto repairs, how to safely handle and use firearms, how to navigate using maps and natural features, and how to do math without a calculator. We should get ready for whatever comes, and we should pray and not worry. Thanks for the mention. I think we have an obligation as Catholics to prepare ourselves for not only the physical and material problems that could come down the pike, but also the ongoing spiritual and moral conflicts that are raging now. Much like the early Church, surrounded by the pagan worship and materialism of their day, so too we are surrounded by the same. This utter dependence upon media, conveniences, and self can’t possibly last a major test. We know, however, that our faith can. We should work together to pass on the Faith and detatch ourselves from possessions so that if/when they go, we are not rocked to our foundation as I’m afraid many would be. Better this than allow our possessions to own us, right? Thank you, Tactical Catholic, for stopping by! Hope to see you here again. Thanks so much for mentioning my apostolate, which is still in formation. I agree with all the suggestions you make in your last paragraph and I’d probably add many more! Yes, I think the “signs of the times” are overwhelming and becoming more so with each passing day. If God does not punish us, nature will. Thank you for stopping by — hope to see you here again!